As practically most of these users are newer and the usage rate is declining very fast (historically, we should be thankful to Opera), may be you’ll think that probably there is no need to show the Internet Explorer users a very great Typography. Its important to know, depending on the user types of the website, you might need to think what is required to use. Peoples of China at the time of writing, still uses Internet Explorer 6. So, at least for commercial websites, it is quite important to show things properly. For non-Microsoft product, tutorial related blogs, honestly; you can ignore the fix and let the browser fall to the second closer font mentioned in the CSS file. In other words – if Internet Explorer users of the particular website historically is more, the time and money investment will be worthy (as market share is falling very fast). So, these are quite important points to consider in the context of Base64 Encoding and Font CSS. 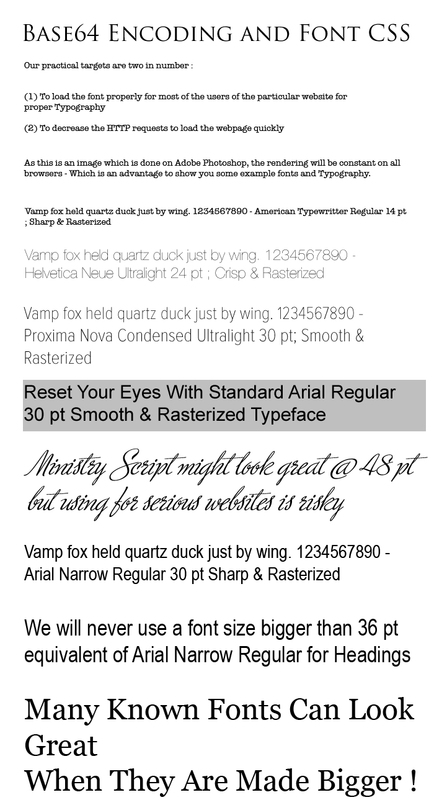 What fonts to use and for which purposes in blogs is a complicated topic itself. Image in CSS to Base64 Data URI and How To Use Any Web Font From Own Hosted Library. These last two links towards two guides are quite important in the context of Base64 Encoding and Font CSS. You can use a TTF font and generate the whole thing kind of automatically. This Article Has Been Shared 1877 Times! Cite this article as: Abhishek Ghosh, "Base64 Encoding and Font CSS," in The Customize Windows, October 21, 2013, April 23, 2019, https://thecustomizewindows.com/2013/10/base64-encoding-and-font-css/.